In today's world of hunting, we can get so consumed with so many different aspects of the hunt. From where and what we want to hunt next, to what gear we need to plan on having next year, to what workout program we are going to do to be better prepared for next season. We always have something to be thinking about or doing, for the next hunt. Even as a guide, we are always preparing for next season. We are always looking at new gear to make our next season easier or better. We think back on our hunts, whether successful or unsuccessful, and try to figure out what we can do different that will improve the hunts next season. For all of us that hunt, sometimes it's fun and refreshing to be reminded of why most of us enjoy to hunt. Those moments may not be recognized immediately during a hunt, but upon reflection, we soon realize "That's Why!" we hunt. Thus, I like to refer to those moments as a "That's Why!" moment. As a guide, I have those moments many times throughout a season and cherish every one of them. Each hunt brings new "That's Why!" moments and new friendships. The friendships are created because of hunting and the "That's Why!" moments I share with each hunter. As I spend most of my time in the field with clients, I have learned to cherish the moments I get with my family when I do get a chance to hunt with them. One such hunt happened in 2017, when I got a chance to hunt antelope with my daughter one October afternoon. We made a stalk on some bedded antelope and ultimately harvested my largest buck to date. But the moment I took the shot and took the buck, seemed minute compared to the other moments we had shared on the hunt. The two of us had a blast crawling throught the sage brush to get into position, trying to avoid prickly pear and sharp rocks. Once we got into position, we had to wait for the buck to get up and present a shot. To pass the time, we laid there in the sagebrush and watched a couple episodes of "The Office" on here phone. It still surprises me that we don't blow the hunt from all the giggling we did! Once we killed the buck, we named decided to name him "Dwight" in honor of the episode we were watching when he stood up and gave me a shot. "Dwight" hangs in my office now and I smile everytime I look at him. Even if I had not gotten that buck, that hunt would have still been one that I would not soon forget and those "That's Why!" moments would still remind me why I love to hunt. We have all had those "That's Why!" moments when we are out in the field. It may be a trophy hanging on a wall or photo taken during a hunt, but we all have something that reminds us "THAT'S WHY!" Providing outstanding big game hunts since 1996 and now equipping hunters with the best gear possible! Visit our ONLINE STORE or call us at (406) 585-9051 to discuss your next Sitka Order! 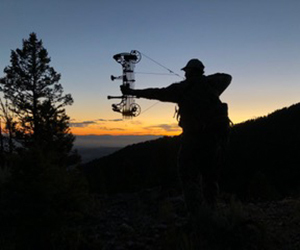 Visit our WEBSITE to learn more about MHC and our hunts for Bison, Elk, Mule Deer, Whitetail Deer, and Antelope.